most often occurs in the discs in the lower back and neck. Osteoarthritis, the breakdown of the cartilage that protects and cushions joints. Spinal stenosis, or the narrowing of the spinal canal, (the open space in the spine that holds the spinal cordand nerves). These conditions may put pressure on the spinal cord and nerves, causing pain and possibly affecting nerve function. Generally, disc degeneration is related to normal aging, joint immobility, and repetitive injury, or trauma. Loss of fluid in the discs. 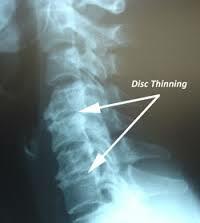 This reduces the ability of the discs to act as shock absorbers, makes them less flexible, more thin, and narrows the distance between the vertebrae. Tiny tears or cracks in the outer layer (annulus or capsule) of the disc. These tears or cracks in the capsule can cause the disc to bulge, break open (rupture), or break into fragments. As the disc space between the vertebrae gets smaller, there is less space between them (stenosis), and the spine becomes less stable. The body reacts to this by depositing bony growths called bone spurs (osteophytes). Bone spurs can put pressure on the spinal nerve roots or spinal cord, resulting in pain and affecting nerve function. Inflammation: The proteins in the disc space can cause inflammation in the disc space that can lead to low back or neck pain, radiating arm or leg pain, hip pain, or sciatic pain. Abnormal biomechanics, causing micro-motion segmental instability. If the annulus or outer ring of the disc becomes damaged, our body is less effective in resisting motion within the spine. This causes instability and results in muscle spasms in an attempt to stabilize the weakened area. This reflex spasm can cause further irritation and pain to the surrounding nerve tissues. Low back pain is generally made worse with sitting, since the lumbosacral discs are loaded three times more than with standing. Walking and exercise generally feel better than prolonged sitting or standing. Patients will generally feel better if they can change positions frequently. Lying down is usually the best position since this relieves compression stresses on the disc space. Degenerative disc disease is diagnosed with a medical history and physical examination. Your doctor will ask about your symptoms, past injuries or accidents, any previous treatment, and habits and activities that may be causing pain in the neck, arms, back, buttocks, or legs. Specialized imaging such as MRI’s or X-rays may also be needed to further evaluate each individual’s condition. These options will be discussed after a thorough history and physical exam have been performed. Treatment options and recommendations will be discussed based on the findings.